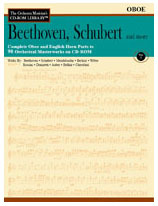 This collection of Full Scores (DVD-ROM) matches the contents of the individual instrumental parts (CD-ROM) for the 90 orchestral masterworks included in The Orchestra Musician's CD-ROM Library, Volume 1: Beethoven, Schubert and more. Scores contain the same rehearsal numbers as the individual parts so that purchasing both results in a complete set of performing materials for all works included in a particular volume. If these scores were purchased separately, this collection could cost $2000 or more. Scores are easily viewable and printable on either PC or Mac. Contents: AUBER Fra Diavolo Overture; BEETHOVEN Symphonies 1-9, Piano Concertos 1-5, Violin Concerto, Overtures (36 works); BELLINI Norma Overture; BERLIOZ Symphonie Fantastique, Benvenuto Cellini Overture, Roman Carnival Overture; CHERUBINI Medea Overture, Anacréon Overtures; DONIZETTI Daughter of the Regiment Overture, Don Pasquale Overture; MENDELSSOHN Symphonies 1-5, Piano Concertos 1-2, Violin Concerto, Elijah, Hebrides Overture, Midsummer Night's Dream Overture and Incidental Music, Ruy Blas Overture; SCHUBERT Symphonies 1-6, 8, 9, Fierrabras Overture, Rosamunde Overture; WEBER Symphony No. 1, Clarinet Concerto, Euryanthe Overture, Der Freischütz Overture, Oberon Overture.